This miniature lily only reaches a height of about 6 inches. A native of the Yunnan area of China as well as Tibet, it is found at elevations of 8,800 to 15,000 feet (2,700 to 4,600 meters). Found on grassy mountain slopes, in thicket margins and fir forest margins, it flowers in June and July with seed ripe in late August / early September. This species over the years has been placed as both Fritillaria as well as Nomocharis. Successfully grown by Pontus Wallsten in Switzerland, he has written that its unique flower form is to protect the vital reproductive organs from heavy summer rains. Photo insert #1 'Lilium lophophorum' in habitat, Big Snow Pass, Yunnan, China. Courtesy of Wikimedia Commons. Copyright Ernst G�gel. Original photo cropped. This file is licensed under the Creative Commons Attribution-Share Alike 3.0 Unported license. 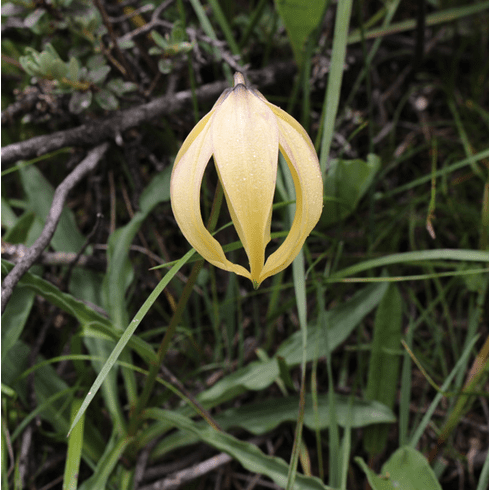 Photo insert #2 'Lilium lophophorum' in habitat, Big Snow Pass, Yunnan, China. Courtesy of Wikimedia Commons. Copyright Ernst G�gel. Original photo cropped. This file is licensed under the Creative Commons Attribution-Share Alike 3.0 Unported license. Photo insert #3 taken by David Boufford showing just how small this species is in nature. Copyright David Boufford. Used with permission. Inserts #4 and #5 copyright Yijia Wang, all rights reserved. Used with permission. Yijia Wang offers seed of several Chinese Alpine Lilies at his nursery at www.canursery.com along with seed of other Chinese Alpine plants.